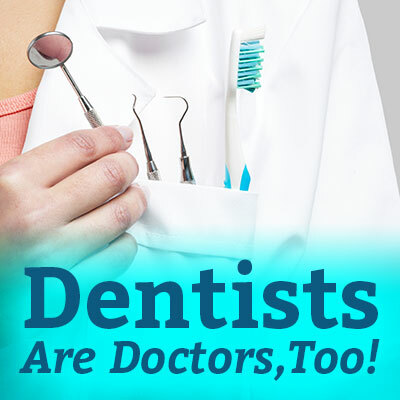 Home » Dentists Are Doctors, Too! Drs. Kunick, Markham, Covelli, Bath-Juech, & Masek, your Cedarburg & West Bend dentists explains how dentistry is a specific branch of medicine, and what it all means for the link between oral health and overall wellness. Have you ever had your whole printer jam because one tiny piece of paper is out of line? It’s endlessly frustrating and time-consuming, and a reminder that machines require all parts, big and small, to be in good shape to get the job done. You are not a printer, but you are made of countless cells, organs, muscles, and bones that all work together to make you human and allow you to survive and be healthy. Dentists look at your mouth, gums, and teeth, but they also look at your jaw (TMJ), face, head and neck, keeping an eye out for signs of a problem such as swelling, discoloration, and more. Often times, dentists also perform tissue biopsies, diagnose illnesses, and screen for high blood pressure and oral cancer. Dentists can tell just by the look of your mouth if you might have other health issues like stress, chronic inflammation or poor quality of sleep. Time and time again, doctors, dentists and researchers come together to find important overlaps in medicine and dentistry. We call these overlaps “the oral-systemic link.” There are already many studies about oral health links to diabetes and heart conditions. Dr Joe Kunick and Dr Adam Markham a general, family & cosmetic dentist, offers dentistry with cleanings, teeth whitening and implants. and enter to win a Visa Gift Card! Call or ask a team member for details.